On how well we get enough sleep, in many respects, and mood depends, and performance. And it is very disappointing that, after giving up the proper time for sleep, in the morning to feel overwhelmed and sluggish. This happens if the mattress is not properly selected. Perhaps it is worth discussing the question of how to choose a mattress for a bed - so that it is both comfortable and useful for the body. Before buying a mattress, you need to very accurately measure the inner perimeter of your bed. We take out the old mattress, then measure with a tape measure from the bed. It may be tempting to measure a pulled mattress - it's easier. But it is not necessary to do this, as over time its dimensions change due to the inevitable deformation. By the way, there is no need to take measurements when buying a new bed - all dimensions should be indicated in the product passport. We measure the inner perimeter of the bed. It happens that the measurements taken give nonstandard results. For example, instead of 80 cm width it turns out 79 or 83 cm. It should be remembered that a discrepancy of up to 1 cm is quite permissible (with a bed size of 79 by 201 cm, feel free to buy a standard mattress 80 by 200 cm). But if the difference is 2 cm or more, you will have to purchase the product to order. Otherwise, the mattress will either not fit in the opening of the bed, or it will hang out in it. In the latter case, the case quickly wears out, which has to be changed frequently. When buying an American mattress for a bed made in Europe (or vice versa), be prepared for the fact that it will be quite difficult. European measures of length are based on centimeters, in contrast to the US, whose starting point is an inch. Take one of the standard American-sized mattresses for a bed - 60 by 80 inches. If we translate inches to centimeters, we get numbers with fractions; the width is 152.4 cm and the length is 203 cm. The standard two-meter length of the European product is initially smaller, and the width is very different. So, the mattress with a width of 160 cm will be too large, and the next size in the line - 140 cm. This is too small. # 1. The easiest way is to buy a bed and a mattress from one manufacturer. They will fit together perfectly. # 2. 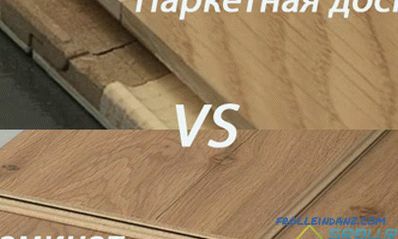 If it is not possible to purchase products of one brand, then you should choose a mattress made in the same country in which the bed is made. # 3. You can make a mattress in size by contacting one of the manufacturers. Domestic factories willingly provide such a service (for a fee, of course). By the way, many well-known European factories producing expensive and prestigious products treat their customers with all the attention. They each model is presented in all sizes (European and American). And the price of products, as a rule, fixed. After all, this is a premium class, and so is very expensive. 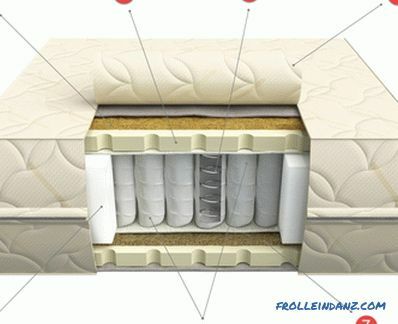 There are two main types of mattresses - with a spring block inside and without it at all. In turn, the spring blocks can also have a different design, on the basis of which they are called dependent or independent. # 1. Dependent spring units. Let's start with the description of dependent spring blocks - as they are called, because when you press on one of the springs, all the others also start to move. This option is cheaper, but it has a minus. After some time, such mattresses stretch strongly in the middle part - it turns out a kind of hammock. And if two people sleep on such a bed, the lighter spouse will inevitably slide to the one who is harder. So it is better to leave dependent spring designs for questioning or other short-term use. 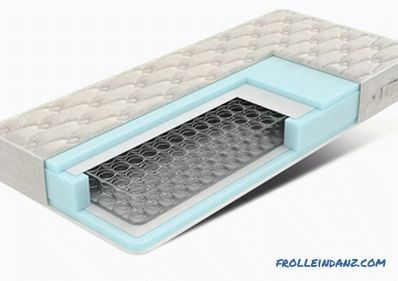 Mattress device with dependent spring block: 1 - mattress upholstery; 2 - spring block dependent springs; 3 - felt layer; 4 - polyurethane foam (foam rubber). 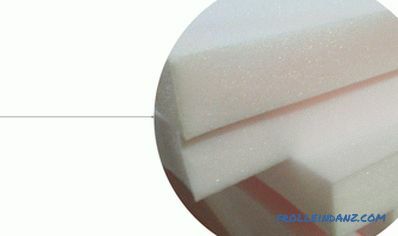 5 - polyurethane foam perimeter. The appearance of the spring unit Bonnel with dependent springs. 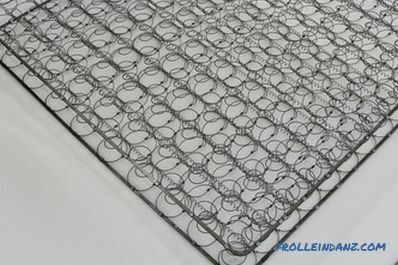 A mattress based on a dependent spring unit. # 2. Independent units are convenient, but expensive. Here, each spring, working separately from the others, is enclosed in a case of a special fabric — a spunbond. Serves a similar mattress for a long time, and no sagging it is not observed. That's just the price he is high enough. And which spring mattress to choose for a bed so that it will serve for a long time and have a reasonable price? Surely many have such a desire. Well, then look at the models with the TFK spring unit - they are the most budget. There are 250 springs per square meter of surface in such a unit. More expensive design S 1000 has such springs 500, and S 2000 - 2 times more. 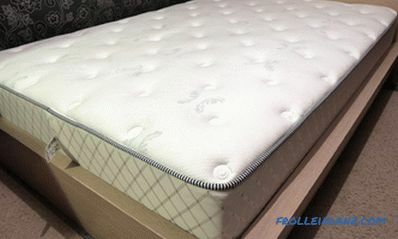 In proportion to the price and number of springs, the orthopedic effect of the mattress also increases.It makes sense to buy similar products for the bed on which you sleep constantly. 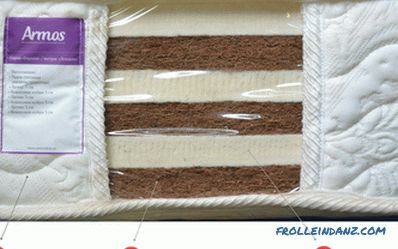 Mattress structure with independent spring block: 1 - coconut coir; 2 - latex layer; 3 - spring in the case; 4 - mattress cover; 5 - mattress perimeter (most often made from polyurethane foam); 6 - independent spring block; 7 - coconut coir. Each spring is sewn into the cover, the result is such tapes from which independent spring blocks are assembled. The mattress is based on an independent spring unit. As the name implies, these are mattresses without springs, they have a simpler device. These products differ in the type of filler that they have inside. As mentioned above, more expensive models are more valuable, the filling of which is natural materials. This is a latex with elasticity, elasticity and anti-allergenicity, as well as coconut chips (coir), which can give the product rigidity. 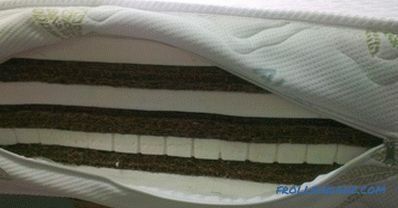 Springless mattress with natural filling of latex and coconut coir. 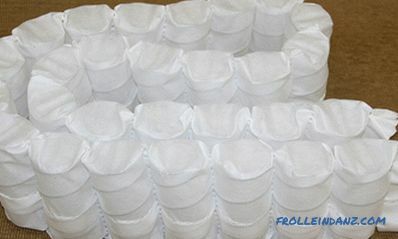 However, those inexpensive types of mattresses for beds, which are filled with artificial materials, are quite popular. 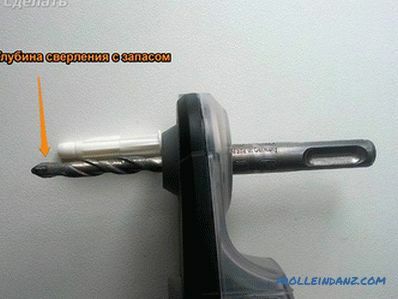 This, in particular, polyurethane foam (foam), artificial latex, as well as holofiber. Naturally, they will serve somewhat less than products with natural materials inside. But after all, their price is much lower. 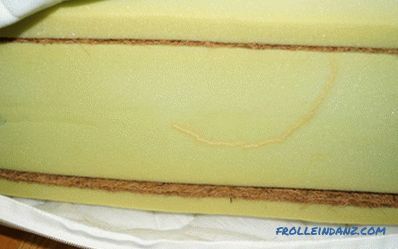 Springless mattress made of polyurethane foam (foam rubber) and coconut coir. If you sleep on a too hard mattress, the weight of the body can be unevenly distributed. Especially unpleasant sensations occur in the area of ​​the shoulders and hips. After all, the biggest loads fall on these zones. And in the morning, waking up on such a mattress, you feel a bit beaten. However, deciding which is better to buy a mattress for the bed, you should not go to another extreme. Too soft a product also does not give a good sleep - muscles and ligaments will be too tense. If a person is thin and light, then a soft mattress will not hurt him - people with a weight of less than 55 kilograms will get enough sleep on it. Those who have an average weight - from 55 to 90 kilograms - you can buy a mattress having an average stiffness. But "heavyweights" from 90 kilograms and more is worth looking towards more rigid products. In this case, do not be afraid of discomfort during sleep - everything will be fine. It will be comfortable to sit on the bed, as the edges of the mattress will most likely not bend. 1. Latex; 2. Coconut coir. 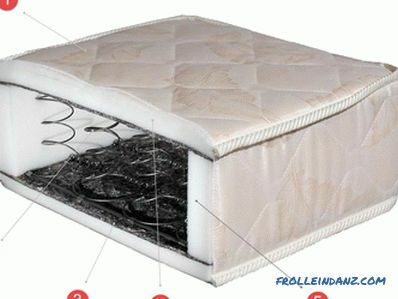 In the photo you can see a double-sided mattress, both sides of which have different rigidity. This is achieved by the fact that the last layer on the one hand is coconut coir, and on the other, a layer of latex. 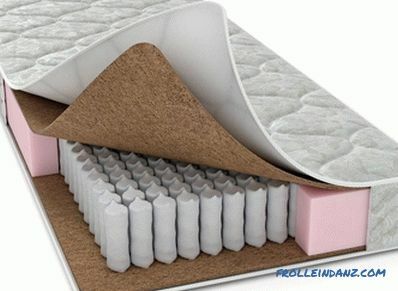 Mattresses with different stiffness can be either springless or with spring blocks (pictured). They can be useful to those who can not accurately determine the rigidity he needs. 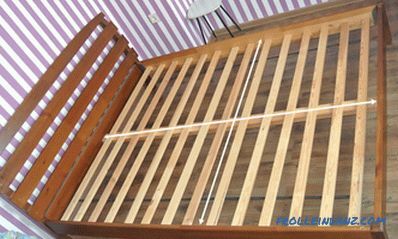 It is the filler located above and under the spring block that determines the characteristics of the rigidity and elasticity of the mattress. The best are "breathing" natural fillers, which also last long enough. However, they have a minus - a fairly high price. We can say one thing: for those whose weight has exceeded one centner, you should still choose exactly the natural content, which is extremely resistant to wear. Stiffness often depends on the thickness and type of filler. 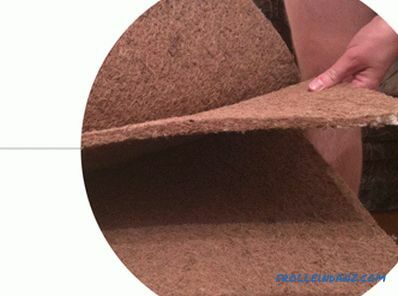 One of the natural materials most commonly used in mattresses is coconut coir. It is often used to give the mattress a certain stiffness. 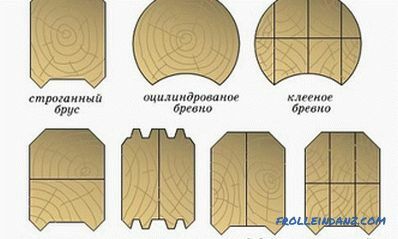 If the thickness of this material is only one centimeter, then we will get a product with medium rigidity. But three centimeters of coconut coir will give a very hard mattress. Another popular natural filler is latex. Latex, unlike coconut, softens the surface and makes it more flexible and comfortable. In addition to natural, many artificial fillers are used. 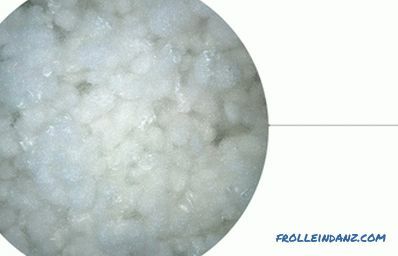 One of the most popular is polyurethane foam, commonly referred to as foam rubber. And from it make and premium mattresses, and low-cost budget products. However, in any case, foam rubber is the cheapest filler. He can have not only different thickness and density, but also the quality of workmanship. 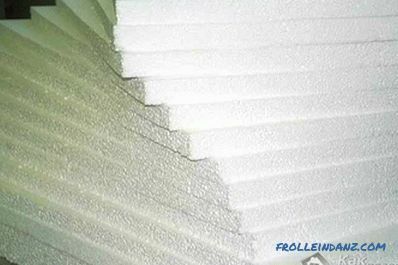 Studying what kind of mattresses for beds, we will stop on one filler, which is considered one of the most elite - this is holofiber. Despite its artificial origin, it is in no way inferior to natural fillers (and sometimes surpasses them). The uniform structure of the holofiber is created due to the large number of small spirals. Products from it perfectly retain heat, allow air, do not absorb moisture and odors. They do not lose their attractive appearance for a long time, they are not deformed. There are all the best properties of mattresses of both spring and springless type. When we come to the mattress store, we first pay attention to their appearance. Here are the manufacturers and try to dress their products in beautiful covers, pleasant to the touch. In addition, it is important that the upholstery is strong enough to withstand many years of operation. Patterns and textures mattress covers offered today, shine diversity. Some can be turned on the wrong side, having a different color. For sewing covers use strong natural (cotton, linen) or artificial (polypropylene, polyester) fabrics. Increase the strength and elasticity of special impregnation. There are anti-allergic impregnation, as well as those that protect from dust. This variety increases the choice of mattress for the bed. The final decision should be made based on your own requests. 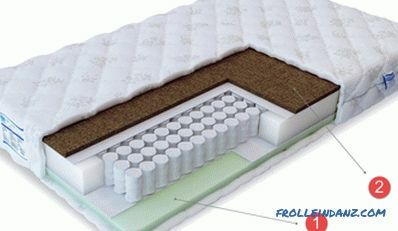 Compared with single and one-and-a-half mattresses, double products must be adapted to higher loads. After all, it’s not just one person to sleep on them, but two. 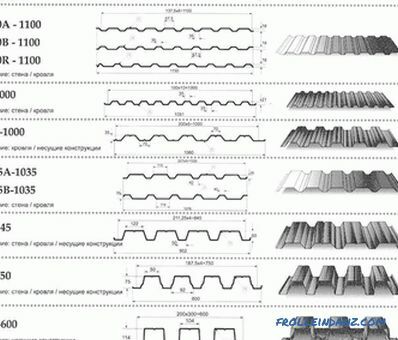 So there will need sufficient elasticity, rigidity and resistance to wear. Particularly difficult when the weight of the spouses who own the bed is different. Let us give an example. A wife, for example, is small and slim, and she weighs only 48 kilograms. And her husband, strong, tall and pumped up, has a weight of almost twice as big - 90 kilograms. It turns out that when choosing a mattress, it will always be uncomfortable for someone alone to sleep. For example, buying a soft product, you can make comfortable only a fragile woman's sleep. Well, a hard or semi-rigid mattress is suitable only for her husband, and she will not be very comfortable. However, it is possible to correct this situation. After all, a wide bed completely allows us to put two narrower ones instead of one large mattress. Some isolation will make it possible not to wake up your “half” while tossing and turning in your sleep. It is possible to purchase two mattresses of different stiffness, each of which will be optimally matched to the build and weight of the person sleeping on it. And don't be confused by the small gap between the mattresses - it is easy to eliminate. 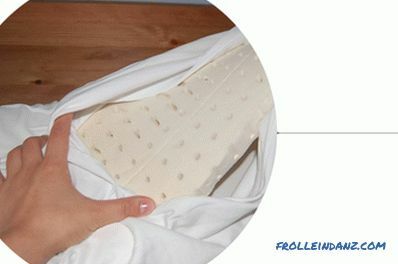 It is enough to buy a thin wide mattress pad, which is a mat without springs. He will connect the two beds into one. However, there are also such families where they don’t want to think about individual mattresses, preferring to sleep side by side, very close to each other. Well - spouses have the right to do so. They can buy a model with two sides that have different stiffness. Let one of them be moderately hard, and the opposite - very soft. First you need to experiment, turning the mattress. Then we can conclude on which side it is better to sleep for both spouses. We think the above tips will help you understand how to choose the right mattress for the bed.